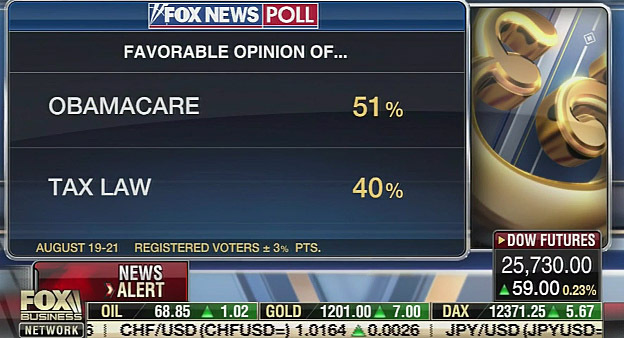 In a new Fox News poll, Obamacare is much more popular than Trump's tax cut bill and a Congressman who helped write it couldn't explain why, except to denounce the poll. A new Fox News poll was released and it found that Americans view Obamacare much more favorable than the Republican tax cuts for the wealthy. This bewildered Charles Payne on the Fox Business Network so he brought on Ohio Republican Congressman Jim Renacci, who helped write the tax-cut law to try and make sense of it. Payne, (subbing for Stuart Varney) said, "It doesn't seem to be resonating. All this great news - how come we don't see it in the polls?" Renacci replied, "Polls don't say everything." He continued, "I'm talking to people that are happy, that are energized, they see more money in their pocket; they're thanking me having that additional money. Those are the crumbs that Nancy Pelosi talked about. Those are the extra dollars they now have to either fix the refrigerator or repair their car. They're happy about that." Let me get this straight, corporations like ATT, reaped billions and billions of dollars in extra profits because of the corporate tax cut but average working-class Americans are grateful just to be able to fix the refrigerator? That's their message? That's selling the tax cut bill? Rennacci, "What we are seen in polls is not reflective on the ground." In other words, the tax cuts are not filtering down to the working class, but I better not say that. Even after Republicans failed to come up with their own health care plan and continually try to gut portions of the ACA, Americans still would rather have Obamacare intact. And if Americans were feeling the supposed positive effects of Trump's tax cuts, they would know it now. That's a remarkable thing in a good economy, but the economy was humming before Trump took office it appears the American people are smart enough to realize that. Oh, and the Robert Mueller probe is viewed more favorable since the beginning of the month.